A record of my creative endeavors. Two skirts handed down to us, and both are too short (by our standards). The solution? Put them together. Voilà! I recently cut off some jeans to make jean shorts. As I looked at the cut off legs, I thought they'd be cute as a skirt for Kewpie. I washed them first, to get it to fray a little. Then I opened up the two pant legs and sewed them to each other. To finish the skirt, I took some blue elastic and sewed it to one end. I love how easy it was, and how cute it turned out! She wears it all the time, and it matches pretty much any shirt she's got. I apologize for the lack of process pictures. This was done at a whim. It took about 30 minutes, and when I looked at it, I thought, "I should have done a tutorial on it." Oh well. Let me tell you how it happened. Kewpie loves nightgowns. I scaled one down for her way back here, and it's gotten too small for her. My mom donated a nightgown she had that she'd never worn. I used the same method as I have in the t-shirt dress. That is, lay a shirt that fits, with the sleeves tucked in, on top of the nightgown with the shoulders matched together. Trace the armholes and sides of the pattern t-shirt onto the nightgown until a few inches below the armholes. Cut out what you've traced, angling out from the tracing until you've reached the edge of the nightgown. Sew the sides back together. To make a hem, I measured how long Kewpie wanted it to be, and cut the nightgown off a few inches above that. Then I used the original hem as a ruffle. I hate hemming knits, so I use the original hem as much as I can. I was going to make sleeves the same as I did in the t-shirt dress, but then I remembered that this is a summer nightgown, and Kewpie gets hot easily. So I took the hem of the original sleeves and used them to make a ruffle around the armhole. I must give credit where it's due. I first wanted to make a circle skirt after seeing Dana's of MADE. 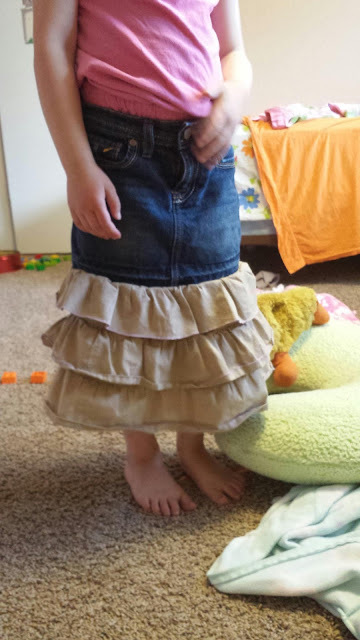 But to actually make the skirt, I used the circle skirt calculator from the snugbug. It is precise and amazing. Since Kewpie has decided that she likes skirts more than pants or shorts, I wanted a skirt that she could wear like shorts. Casual, fun, not show the dirt. So I used an old heather gray t-shirt. For the waistband, I did the same as a skirt I made for myself here. Super comfy, no need for elastic. I must make more circle skirts. They even make walking more fun. And it hangs so well. As a side note, it might be noticeable that I haven't posted much as of late. At the moment, life (baby and sickness) has taken over, and sewing was shoved into the back seat. But I've woken from sewing dreams lately and my mind is brimming with ideas of fun things to do. We'll see if real life will allow for those to become real. Meanwhile, I'll post a few projects I didn't have time to post before, to appease my hunger to create again. I share my ideas willingly with you. My photographs are precious to me because of the models I use to show off what I've done. The photos are my property. Please do not use them without my written permission.